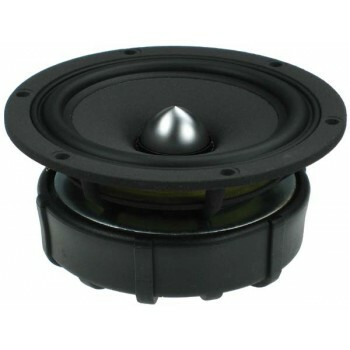 SEAS W12CY003 E0044-08 MidWoofer. £108.85 excl. VAT. 4.5” Nextel coated paper cone. Outstanding extended response, v. low distortion. 2 Cu PP rings for extra power handling. Chrome plated phase plug. The SEAS W12CY003 E0044-08 is a 12cm (4,5’’) woofer/midrange unit. The paper cone with a unique Nextel coating ensures outstanding extended smooth frequency response and low distortion. Heavy copper rings mounted above and below the T-shaped pole piece reduce non linear and modulation distortion and increase overload margin. A large magnet system provides good sensitivity and transient response. A chrome plated brass phase plug reduces compression due to temperature variations in the voice coil, increases long term power handling capacity and eliminates resonances in the cavity inside the voice coil former. An extremely stiff and stable injection moulded Nextel coated metal basket keeps the critical components in perfect alignment. Large windows in the basket both above and below the spider reduce sound reflection, air flow noise and cavity resonance to a minimum.